Adam adama savunmaya karşı en etkili hücum setlerini hem çizimli hem de görüntülü olarak burada izleyip sisteminize ve kadronuza uygun olanlar seçerek takımlarınızda kulllanbilirsiniz..Hücum setlerinin çoğunluğu NCAA ve NBA takımlarının en çok kullandıkları oyunlardır..
Today’s Play of the Day comes from the Ohio State Buckeyes during their 2012 NCAA Men’s Tournament run. This simple box set gives several options to enter the ball to the post. Frame 1: 1 dribbles right as 2 diagonal screens for 4 and 3 spaces to corner. 1 can pass to 4 in post if open. 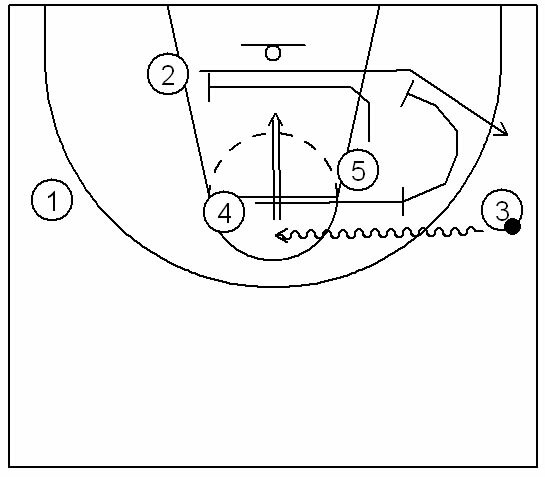 Frame 2: 2 and 5 set a staggered screen for 3 curling to basket as 4 spaces to corner. 1 can hit 3 if open. Frame 3: 5 screens the screener for 2. 1 passes to 2 for the shot. Frame 4: If 2 does not have the shot, 5 buries defender in paint and 2 passes to 5. This is a half-court set from Louisville in the 2012 NCAA Men’s Tournament. 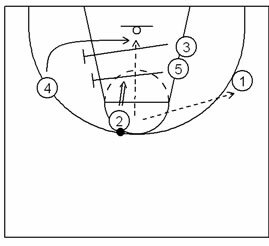 Louisville used this particular set quite often during their Final Four run. Frame 1: 2 cuts off of 4 and 5 setting an elbow double screen for 3. 3 receives pass from 1. Frame 2: 4 and 5 set a staggered screen for 2 cutting back to ballside wing to receive pass from 3. 1 relocates to weakside wing. Frame 3: 5 rolls to low post and receives post entry from 2. Frame 4: If 5 does not score in the post, 2 screens for 3 and 5 kicks out to 3 as 4 flashes to the high post. 3 looks to shoot or hit 4 in the high post for a shot or high-low pass to 5. Use this set to pound the ball in to a dominant post player, or take advantage of a defense that is keying on that player. 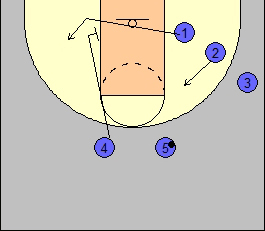 4 and 5 set a staggered ball screen for 1. 3 spaces to corner. 5 rolls as 2 cuts to the top. 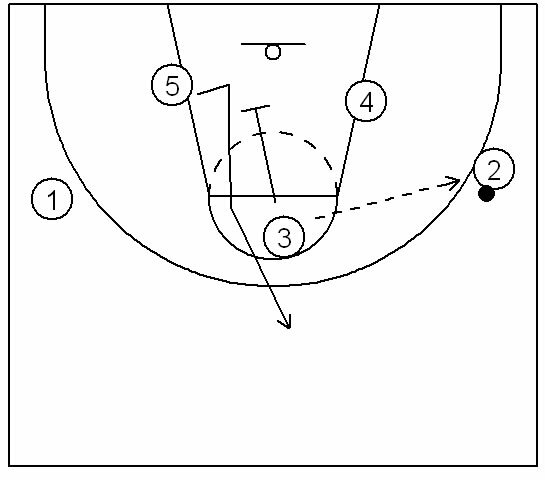 4 flares to the wing after setting the ball screen and receives a pass from 1. 4 feeds 5 in the post. If 5 doesn’t have an advantage, 1 sets a back screen for 2. 5 can hit 2 for the backdoor layup, or 4 bumping the basket cut for a shot. This is a half-court set run by North Carolina in the 2012 NCAA Men’s Tournament. This box set utilizes spacing and quick ball movement to create scoring opportunities. 5 steps out to wing to receive pass from 1. 1 pins down for 4 to the top of key. 2 flashes across the lane and 3 spaces to corner. 5 swings to 4, 4 reverses to 1. 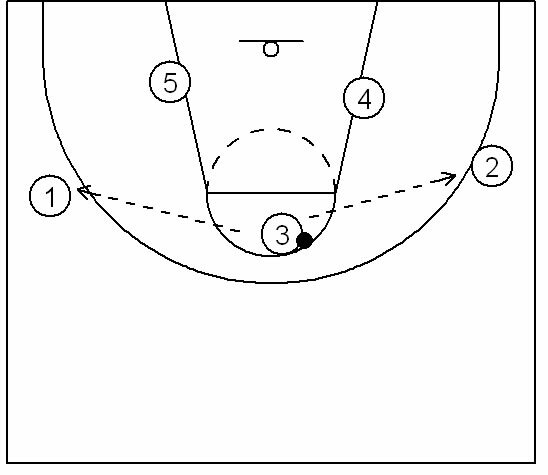 2 sets a back screen for 5 looping to ball side post. 1 can hit 5 if open. 4 pins down for 2, who catches the pass from 1 at the top and looks for 4 rolling down the lane. is a 1-4 High set use by Saint Louis in the 2012 NCAA Tournament. The Billikens used this half-court set to get a dribble handoff over the top for a dribble penetration layup..
4 steps out to receive pass from 1. 5 back screens for 1 to corner. 4 can hit 1 if open, otherwise 5 shapes up to receive pass. 3 and 4 set a staggered screen for 1, who receives a dribble handoff from 5. 1 attacks the rim looking to score, hit 5 on the roll, or kick to 2 spotted up. This is a half-court set run by Michigan State in the 2012 NCAA Men’s Tournament. This double floppy action sets up a post feed for the big to score or dump opposite to a partner. Frame 1: 5 pins in for 2 to the wing. 3 loops around 4. Frame 2: 4 steps out to receive pass from 1. 3 screens for 5, who loops under the basket. Frame 4: If the defense doubles down on 5, 3 should be open for the quick dump down. It uses a dribble handoff looking for an easy basket, then attacks over the top with weak side shot opportunities. Frame 1: 4 screens for 3 who receives pass from 1. 5 screens for 1 to the basket. 3 can hit 1 if open. Frame 2: 5 shapes up after screen to receive pass from 3. 1 clears to corner. Frame 3: 1 and 4 elevate while 3 loops to corner. While this action occurs, 5 dribbles at 2 for a dribble handoff. Frame 4: 2 curls the handoff tight and attacks over the top. 2 can hit 5 on the roll or skip to a shooter spotted up on the weak side. ‘Shotgun Dunk’ from the Pride of Iowa Senior All-Star game. 5 sets up as the ‘long snapper’ with 1 as the QB in shotgun formation. 3 goes ‘in motion’ right. 3 runs a post pattern as 1 rolls out left to deliver the alley oop pass. Rakibin kafasını karıştıran basketbolcular sayıyı alley-oop ile buldu. Tıklayın..Bu müthiş alley oop oyununu izleyin..
will put you in touch with Coach Burns. Brad McGhee, Head Boys Coach Liberty High School, Mountain View, Mo. down the lane line and sets a down screen for 2. 2 uses the screen and pops to the top of the key. for 2. 2 can either look for the shot or make an entry pass in to 5 posting up on the low block. she looks for 3 for a 3-point shot at the top. Frame 1 – Wings must be high (hash mark was a good point of reference). Spacing is key. We start any action by passing to the wing or post on either side. Frame 2 – On a pass to the wing, 4 and 5 work up and down the lane, and sometimes cross. In this action the 4 back screens for 1 cutting to the basket. If open, 1 should call for the ball by putting a hand up. 5 is looking to pin the defender for a quick post up. Frame 3 – If 1 and 5 are not open, 2 swings the ball to 4 at the top. 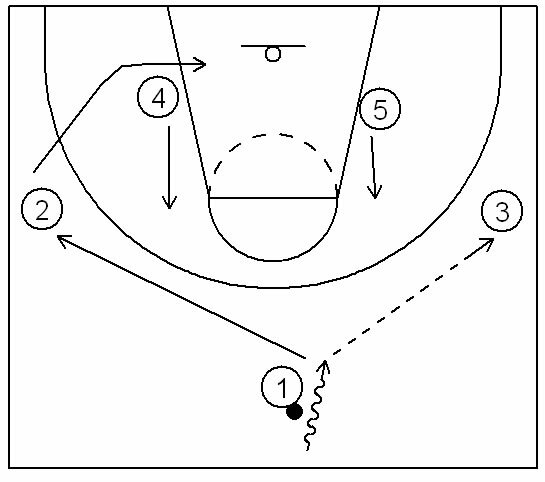 As that pass occurs, 1 cuts to the wing and sets a lane screen for 5. 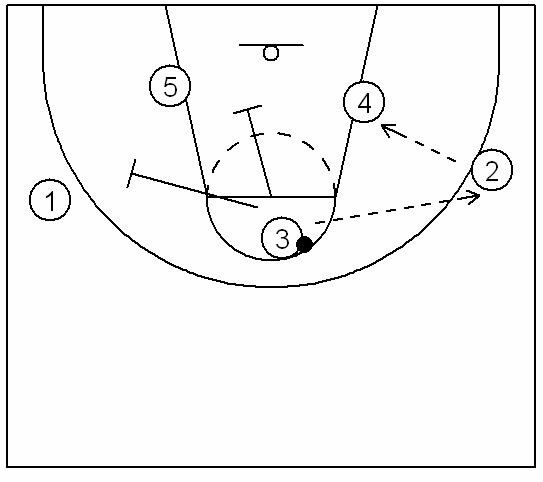 Frame 4 – 4 quickly reverses the ball to 1 who looks inside for 5 coming off of the lane screen and posting up. All of these passes must be quick and precise (no bounce passes!). 1 – 4 high across to begin. #1 takes it on the dribble towards #2 on the right wing. When that happens, #2 comes across the top off of screens from both #5 and #4.#1 takes the ball back in the direction #2 is cutting. #3 cuts down towards the middle of the lane, underneath the basket area. 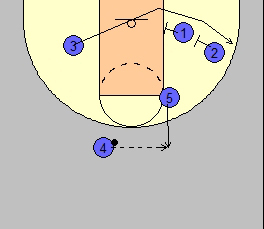 Once #2 has the ball on the wing, #4 and #5 set a double down screen for #3 underneath the basket.If you wish, you may even add #1 to complete the triple staggered screen. We will assume that #2 was not open in the beginning. If that is the case, #4 and #5 would still continue down and screen for #3 underneath the basket.#2 would continue down to the low block area, ready to replace #3 underneath the basket.#1 can hit #3 off the double staggered screen if he is open. direction and find #2’s defender for a double screen or a double staggered screen. If #3 wasn’t open on that play, he would continue cutting and curl around and out of the play while #4 and #5 would set the double or double staggered screen for #2.Great continuous screen action from your post people trying to free your perimeter people for a jump shot. After passing to 4, 1 cuts off the backscreen from #5. 2 and 3 move toward the lane. if 1 is open, 4 will pass to him/her, but that will not be open very often. 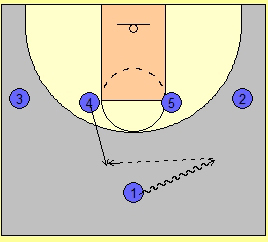 4 passes to 5 as 1 and 2 are setting a staggered screen for 3. If 3 is open, 5 will make the pass. After passing to 5, 4 cuts to the block to screen for #1. #4 and #5 flash up to the elbows. After passing, #1 cuts away to the back side wing. #2 moves down to the back side block. After #3 receives the ball , #5 rolls down and screens across for #2.#4 moves across and sets a ball screen for #3.#3 drives the ball off the screen and looks to create a shot opportunity in the lane. Note : #2 will not start his cut until #3 dribbles off the ball screen. If #3 does not have a shot opportunity, he can make a pass to either #1 on the back side , or he can throw back to #2 , who has received a double screen on the baseline. In this situation #3 has made the throw back to #2. After making the throw back , #3 can screen down or screen away.#2 may have a shot opportunity or an opportunity the feed the low post. This diagram shows #3 making the throw back pass and screening down for #5. If #2 does not have a shot opportunity or cannot feed the low post , he will make the pass to #5 at the swing spot.On the pass out to the swing spot , the ball side low post will step ou t and set a back screen for the passer. Rule: Anytime a player sets a back screen , he will step out and fill the vacated spot. This play is run against a man to man defense. From Coach Creighton Burns’ newsletters. If you are interested in receiving his newsletter, contact us and we will put you in touch with Coach Burns. O1 reversed the ball to O2, who quickly reversed it to O4. O1 would cut off a screen from O5 and O2 cuts to the ball-side corner. After setting the screen O5 steps out to the top. O4 passes the ball to O5 at the top and O5 reverses the ball to O3 at the wing. If O3 is denied then O3 has space to back-cut. After reversing the ball O4 immediately cuts off a back screen from O1. O3 must look inside to O4. O5 will set a down screen for O1, in a screen the screener action. If O3 does not hit O4, then the next look is for O1 coming off the down screen. After setting the down screen O5 must post up. Basketball Plays–MSU GreenI found this on one of Creighton Burns’ newsletters. He got it from Tom Izzo. #1 enters the ball to #2 and runs a “rub cut” of f the back screen set by #4. If #1 is open on the cut , #2 can get him the ball. 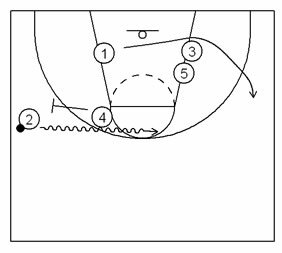 #5 and #3 move down to set a double screen at the back side block. After #1 cuts past , #4 steps out and sets a ball screen for #2. #2 drives the middle and #1 cuts around the double screen on the back side. If #2 is open on his drive , he may have a shot in the lane. As soon as #1 cuts past the double screen, #3 and #5 move to set a second double screen for #4. #2 will look for #4 rolling to the rim off the double screen , or he can feed #1 on the wing.